1 2 3 4 SenGupta DJ, Unadkat JD (2004). 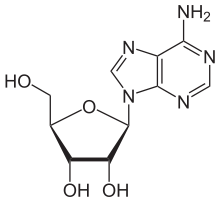 "Glycine 154 of the equilibrative nucleoside transporter, hENT1, is important for nucleoside transport and for conferring sensitivity to the inhibitors nitrobenzylthioinosine, dipyridamole, and dilazep.". Biochem Pharmacol. 67 (3): 453–458. doi:10.1016/j.bcp.2003.09.018. PMID 15037197. ↑ Endres CJ, Sengupta DJ, Unadkat JD (2004). "Mutation of leucine-92 selectively reduces the apparent affinity of inosine, guanosine, NBMPR [S6-(4-nitrobenzyl)-mercaptopurine riboside] and dilazep for the human equilibrative nucleoside transporter, hENT1.". Biochem J. 380 (1): 131–137. doi:10.1042/BJ20031880. PMC 1224139 . PMID 14759222. ↑ Chaudary N, Naydenova Z, Shuralyova I, Coe IR (2004). "The adenosine transporter, mENT1, is a target for adenosine receptor signaling and protein kinase Cepsilon in hypoxic and pharmacological preconditioning in the mouse cardiomyocyte cell line, HL-1.". J Pharmacol Exp Ther. 310 (3): 1190–1198. doi:10.1124/jpet.104.067157. PMID 15131243. 1 2 3 4 5 6 Goldfrank, Lewis R.; Neal Flomenbaum; Mary Ann Howland; Robert S. (2006). Goldfrank's toxicologic emergencies. p. 243. 1 2 3 Narimatsu E, Niiya T, Kawamata M, Namiki A (2006). "[The mechanisms of depression by benzodiazepines, barbiturates and propofol of excitatory synaptic transmissions mediated by adenosine neuromodulation]". Masui. 55 (6): 684–691. PMID 16780077. ↑ Tohdoh Y, Narimatsu E, Kawamata M, Namiki A (2000). "The involvement of adenosine neuromodulation in pentobarbital-induced field excitatory postsynaptic potentials depression in rat hippocampal slices.". Anesth Analg. 91 (6): 1537–1541. doi:10.1097/00000539-200012000-00044. PMID 11094014. ↑ Patel J, Marangos PJ, Skolnick P, Paul SM, Martino AM (1982). "Benzodiazepines are weak inhibitors of [3H]nitrobenzylthioinosine binding to adenosine uptake sites in brain.". Neurosci Lett. 29 (1): 79–82. doi:10.1016/0304-3940(82)90368-8. PMID 7070715. ↑ York MJ, Davies LP (1982). "The effect of diazepam on adenosine uptake and adenosine-stimulated adenylate cyclase in guinea-pig brain.". Can J Physiol Pharmacol. 60 (3): 302–307. doi:10.1139/y82-041. PMID 6280826. ↑ Ujfalusi A, Cseppentö A, Nagy E, Szabó JZ, Kovács P, Szentmiklósi AJ (1999). "Sensitization by chronic diazepam treatment of A2A adenosine receptor-mediated relaxation in rat pulmonary artery.". Life Sci. 64 (2): PL19–25. doi:10.1016/S0024-3205(98)00547-5. PMID 10069495. ↑ Narimatsu E, Niiya T, Kawamata M, Namiki A (2008). "Adenosine and adenosine uptake inhibitors potentiate the neuromuscular blocking action of rocuronium mediated by adenosine A(1) receptors in isolated rat diaphragms.". Acta Anaesthesiol Scand. 52 (10): 1415–1422. doi:10.1111/j.1399-6576.2008.01714.x. PMID 19025536. ↑ Bender AS, Hertz L (1986). "Similarities of adenosine uptake systems in astrocytes and neurons in primary cultures.". Neurochem Res. 11 (11): 1507–1524. doi:10.1007/BF00965770. PMID 2891057. ↑ O'Regan MH, Phillis JW (1988). "Potentiation of adenosine-evoked depression of rat cerebral cortical neurons by triazolam.". Brain Res. 445 (2): 376–379. doi:10.1016/0006-8993(88)91203-6. PMID 3370471. 1 2 Phillis JW, Delong RE (1984). "A purinergic component in the central actions of meprobamate.". Eur J Pharmacol. 101 (3-4): 295–297. doi:10.1016/0014-2999(84)90174-2. PMID 6468504. 1 2 DeLong RE, Phillis JW, Barraco RA (1985). "A possible role of endogenous adenosine in the sedative action of meprobamate.". Eur J Pharmacol. 118 (3): 359–362. doi:10.1016/0014-2999(85)90149-9. PMID 4085561. ↑ Gonzalez LA, Gatch MB, Taylor CM, Bell-Horner CL, Forster MJ, Dillon GH (2009). "[Carisoprodol-mediated modulation of GABAA receptors: in vitro and in vivo studies.". J Pharmacol Exp Ther. 329 (2): 827–837. doi:10.1124/jpet.109.151142. PMC 2672873 . PMID 19244096. ↑ Wang S; Cone J; Fong M; Yoshitake M; Kambayashi Ji; Liu Y. (2001). "Interplay between inhibition of adenosine uptake and phosphodiesterase type 3 on cardiac function by cilostazol, an agent to treat intermittent claudication.". J Cardiovasc Pharmacol. 38 (5): 775–783. doi:10.1097/00005344-200111000-00014. PMID 11602824. 1 2 3 4 5 Phillis JW, Wu PH (1982). "The effect of various centrally active drugs on adenosine uptake by the central nervous system.". Comp Biochem Physiol C. 72 (2): 179–187. doi:10.1016/0306-4492(82)90082-X. PMID 6128137. 1 2 Phillis JW. (1984). "Potentiation of the action of adenosine on cerebral cortical neurones by the tricyclic antidepressants.". Br J Pharmacol. 83 (2): 567–575. doi:10.1111/j.1476-5381.1984.tb16521.x. PMC 1987110 . PMID 6487906. ↑ Stein MB, Black B, Brown TM, Uhde TW (1993). "Lack of efficacy of the adenosine reuptake inhibitor dipyridamole in the treatment of anxiety disorders.". Biol Psychiatry. 33 (8-9): 647–650. doi:10.1016/0006-3223(93)90105-M. PMID 8329495. 1 2 Phillis JW, Bender AS, Marszalec W (1985). "Estradiol and progesterone potentiate adenosine's depressant action on rat cerebral cortical neurons.". Gen Pharmacol. 16 (6): 609–612. doi:10.1016/0306-3623(85)90151-x. PMID 2935451. ↑ Allen-Gipson DS, Jarrell JC, Bailey KL, Robinson JE, Kharbanda KK, Sisson JH, Wyatt TA (2009). "Ethanol Blocks Adenosine Uptake via Inhibiting the Nucleoside Transport System in Bronchial Epithelial Cells.". Alcohol Clin Exp Res. 33 (5): 791–8. doi:10.1111/j.1530-0277.2009.00897.x. PMC 2940831 . PMID 19298329. ↑ Verma A, Houston M, Marangos PJ (1985). "Solubilization of an adenosine uptake site in brain.". J Neurochem. 45 (2): 596–603. doi:10.1111/j.1471-4159.1985.tb04028.x. PMID 2989430. 1 2 Phillis JW, Wu PH, Coffin VL (1983). "Inhibition of adenosine uptake into rat brain synaptosomes by prostaglandins, benzodiazepines and other centrally active compounds.". Gen Pharmacol. 14 (5): 475–479. doi:10.1016/0306-3623(83)90106-4. PMID 6416920. ↑ Ngai AC, Monsen MR, Ibayashi S, Ko KR, Winn HR (1989). "Effect of inosine on pial arterioles: potentiation of adenosine-induced vasodilation.". Am J Physiol. 256 (3 (Pt2)): H603–H606. PMID 2923227. ↑ Noji T, Nan-ya K, Mizutani M, Katagiri C, Sano J, Takada C, Nishikawa S, Karasawa A, Kusaka H (2002). "KF24345, an adenosine uptake inhibitor, ameliorates the severity and mortality of lethal acute pancreatitis via endogenous adenosine in mice.". Eur J Pharmacol. 454 (1): 85–93. doi:10.1016/S0014-2999(02)02476-7. PMID 12409009. ↑ Lee CM, Cheung WT (1985). "Inhibitory effect of adenosine on electrically evoked contractions in the rat vas deferens: pharmacological characterization.". Neurosci Lett. 59 (1): 47–52. doi:10.1016/0304-3940(85)90213-7. PMID 2995881. ↑ Marangos PJ, Patel J, Clark-Rosenberg R, Martino AM (1982). "[3H]nitrobenzylthioinosine binding as a probe for the study of adenosine uptake sites in brain.". J Neurochem. 39 (1): 184–191. doi:10.1111/j.1471-4159.1982.tb04717.x. PMID 7086410. ↑ Coffin VL, Taylor JA, Phillis JW, Altman HJ, Barraco RA (1984). "Behavioral interaction of adenosine and methylxanthines on central purinergic systems.". Neurosci Lett. 47 (2): 91–98. doi:10.1016/0304-3940(84)90412-9. PMID 6205333. ↑ Shi D, Daly JW (1999). "Chronic effects of xanthines on levels of central receptors in mice.". Cell Mol Neurobiol. 19 (6): 719–732. doi:10.1023/A:1006901005925. PMID 10456233. ↑ Phillis JW. (1985). "Chlorpromazine and trifluoperazine potentiate the action of adenosine on rat cerebral cortical neurons.". Gen Pharmacol. 16 (1): 19–24. doi:10.1016/0306-3623(85)90264-2. PMID 2984085. ↑ Phillis JW. (1984). "Interactions of the anticonvulsants diphenylhydantoin and carbamazepine with adenosine on cerebral cortical neurons.". Epilepsia. 25 (6): 765–772. doi:10.1111/j.1528-1157.1984.tb03489.x. PMID 6510384. ↑ Andiné P, Rudolphi KA, Fredholm BB, Hagberg H (1990). "Effect of propentofylline (HWA 285) on extracellular purines and excitatory amino acids in CA1 of rat hippocampus during transient ischaemia.". Br J Pharmacol. 100 (4): 814–818. doi:10.1111/j.1476-5381.1990.tb14097.x. PMC 1917600 . PMID 2207501. ↑ Ohmori H, Sato Y, Namiki A (2004). "The anticonvulsant action of propofol on epileptiform activity in rat hippocampal slices.". Anesth Analg. 99 (4): 1095–1101. doi:10.1213/01.ANE.0000130356.22414.2B. PMID 15385357. ↑ Noji T, Nan-ya K, Katagiri C, Mizutani M, Sano J, Nishikawa S, Karasawa A, Kusaka H (2002). "Adenosine uptake inhibition ameliorates cerulein-induced acute pancreatitis in mice.". Pancreas. 25 (4): 387–392. doi:10.1097/00006676-200211000-00011. PMID 12409834. ↑ Gresele P, Arnout J, Deckmyn H, Vermylen J (1986). "Mechanism of the antiplatelet action of dipyridamole in whole blood: modulation of adenosine concentration and activity.". Thromb Haemost. 55 (1): 12–18. PMID 3704998. ↑ Bauman LA, Mahle CD, Boissard CG, Gribkoff VK (1992). "Age-dependence of effects of A1 adenosine receptor antagonism in rat hippocampal slices.". J Neurophysiol. 68 (2): 629–638. PMID 1388201. ↑ Boissard CG, Gribkoff VK (1993). "The effects of the adenosine reuptake inhibitor soluflazine on synaptic potentials and population hypoxic depolarizations in area CA1 of rat hippocampus in vitro.". Neuropharmacology. 32 (2): 149–155. doi:10.1016/0028-3908(93)90095-K. PMID 8383814.